Today is officially the first day of fall (yesterday having been the autumnal equinox-nerd alert!) and I think our taste buds are ready for the transition. So, it finally seems seasonally appropriate to blog about soup. As opposed to when I MADE the soup and it was 80° out. Lesson learned. Repeat after me: “Seasonally appropriate”. Split pea soup is one of the things I hated when I was young and have grown to appreciate. 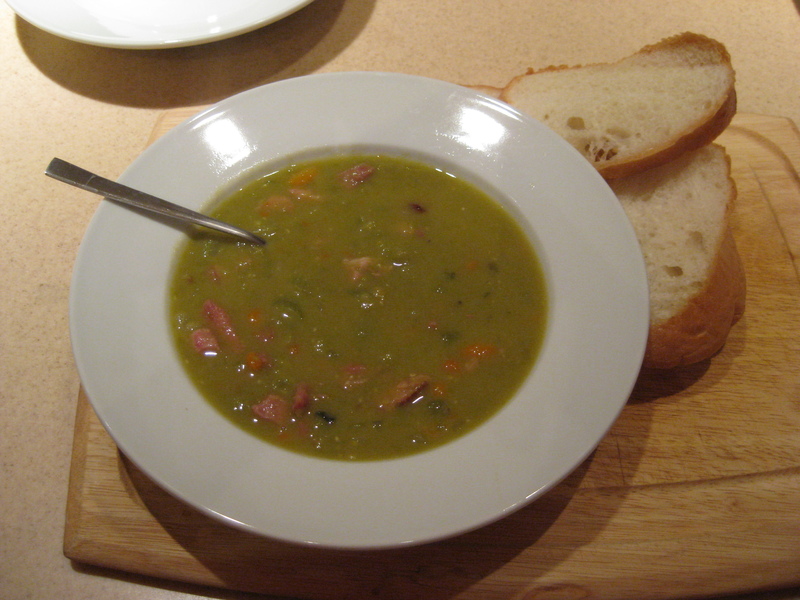 Great split pea is creamy, but thick and with a touch of smokiness from the ham. I found this recipe from Bon Appetit on Epicurious.com that seemed straightforward and classic. And we’re off…. The basic ingredients are pretty friendly: onions, carrots, celery, and butter. 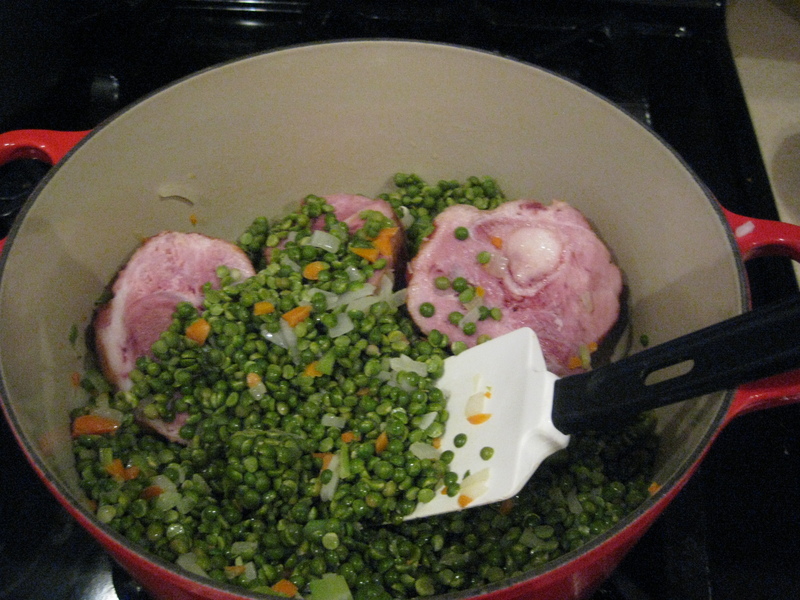 But you also need pork hocks and split peas. Um, ok…two new ones for me. I found split peas with the rice at my grocery store. They come in a bag and honestly cost like $1. They are dried peas that have been, well split. Check and check. I had noticed pork hocks on the top shelf of the meat case before. They look like a big, tapered bones with a opening at one end. Mine came two in a pack. A little scary…but so delicious. Sidenote: “hock” just sounds hearty, don’ t you think? When I say it out loud I think my voice even gets a little lower. Like a woodsman or something. I don’t really know what a woodsman is. Ingredients...check out that pork hock! Back to the soup. Melt your butter and toss in the chopped veggies. Once they are soft, in goes the marjoram and then add the pork hocks. So, you could say that last step was ad hoc. YES– my first lawyer/food pun! So, after a minute add the water (I used 1/2 chicken stock and 1/2 water) and bring it all to a boil. Reduce the heat and cook, cook, cook. The peas and other veggies will be falling apart by this point. Remove the hock and set aside. The recipe calls for pureeing the soup in a blender, but I like to use an immersion blender, which blends right in the pot. Anything that keeps me from having to move around batches of hot liquid is a good thing. Trust me. 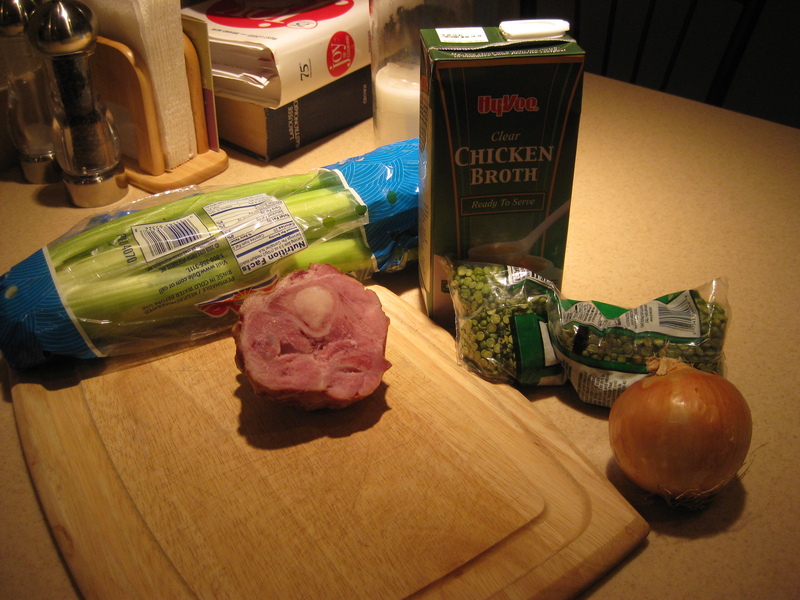 Next the pork gets cut off the hock (woodsman voice) and goes back into the soup. And we’re ready to serve. TA-DA!! The soup was fan-tastic. Cooking with the bone adds a richness and a little smokey flavor. And the pureed peas are a nice smooth texture with the ham. And it was pleasantly salty, but it seems creamy from the blending of the veggies. UNFORESEEN BONUS: I made “real” soup. I mean…this is as hearty and homemade tasting as it gets. Cooking with the “leftover” bones imparts a richness that you just can’t get otherwise. 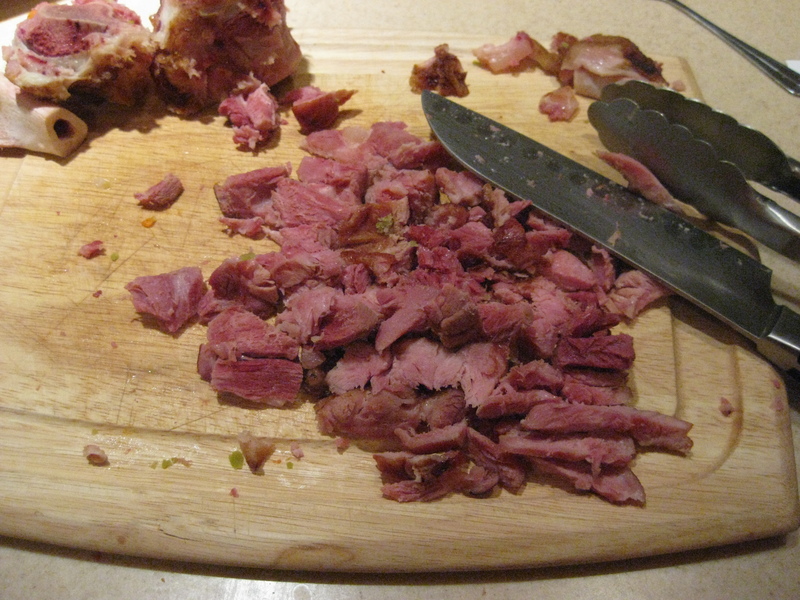 Save the leftovers next time you make a ham….trust me on this one. 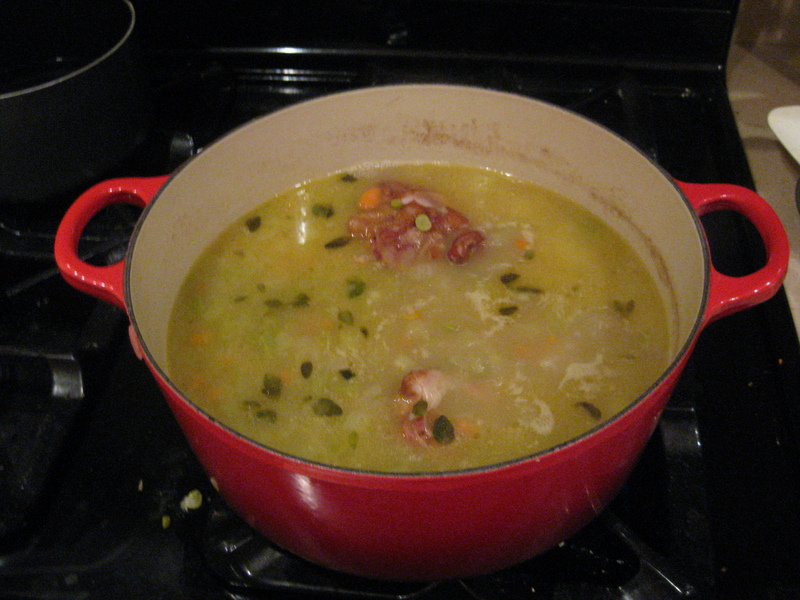 Oh, and we have a quart of split pea soup in the freezer becuase the day after I made this it was 91°. This entry was posted in 30 Before 30 and tagged ham, hocks, turning 30. Bookmark the permalink. Great post! I could eat soup for every winter meal! 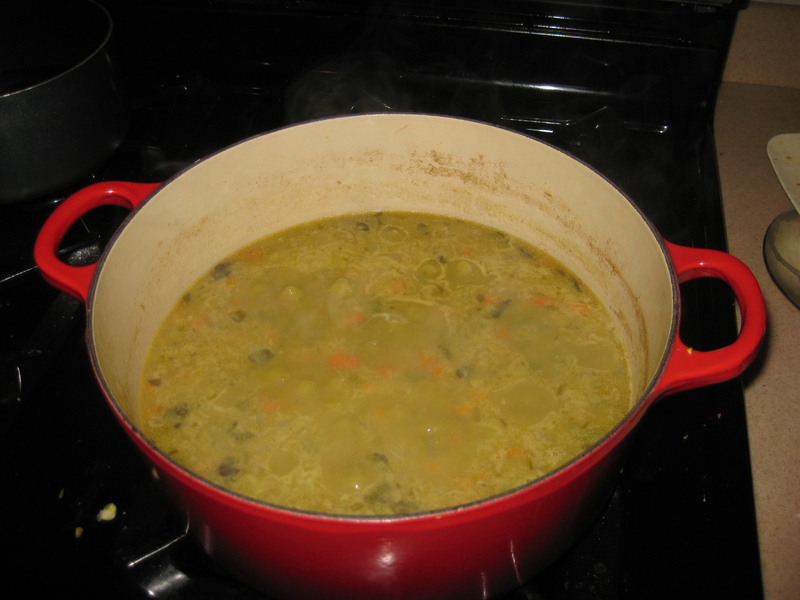 split pea is one of my favorite soups!! yours looks like it would have any woodsman coming back for more!! please mail that to me stat! DELICIOUS!